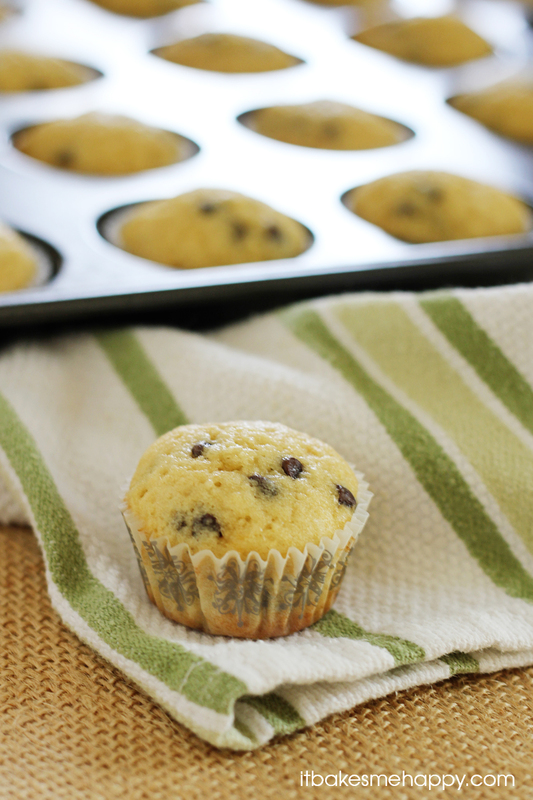 Start your morning off right with these tender, lightly sweet Chocolate Chip Mini Muffins. A couple of months ago I was contacted by Time Out For Women and asked to write a guest post, my first thought was for real? My second thought was wow, I feel special, I mean who am I in the vast world of food bloggers and they asked me! I have found so much happiness in sharing my passion and food with the ones I love.I especially enjoy preparing and sharing family recipes, I love the feeling of nostalgia that comes when I cook something my great grandmother used to make. This past December my aunt compiled a family cookbook, which featured many of her favorite recipes that my grandmother used to make, as well as recipes of her own and her grandmother. I’ve had so much fun exploring and experimenting in the months since receiving this book for Christmas! I can’t help remembering the times I shared with my family as a child and the great food we enjoyed. I’m so glad that I have a printed source I can turn to when I want to feel close to my family, I hope one day to be able to do the same thing for my own children and grandchildren. Today I am sharing a recipe for muffins, an adaptation of a blueberry muffin recipe passed on from my aunt. If there is one thing my family and friends know about me, it is that muffins are one of my absolute favorite breakfast treats. If you visit my recipe archives you’ll see I have a slight obsession. These miniature muffins are moist, lightly sweet and filled with little bites of chocolate goodness; enjoy and happy baking! Preheat your oven to 375º and line a mini muffin pan with papers. In the bowl of your stand mixer, or a large mixing bowl using a hand mixer, cream the coconut oil and sugars until fluffy. Add the egg and blend well, then add the vanilla. Add the flour, baking powder, salt and milk and mix until just combined. Add the chocolate chips, mixing just until incorporated. Spoon 1 Tbs of batter into each baking cup and bake for 10-12 minutes until golden on top. These looks like great muffins. Mini are so cute and I love using coconut oil in my bake goods. Love that you adapted your aunt’s recipe! Mini muffins are perfect to grab and go! I love mini anything, but these looks SO good! Can’t wait to try making a batch of these. I found your blog through Grow Your Own Blog party, and it looks terrific! I’ve subscribed via RSS as you’ve got some mouthwatering recipes! My kids and I love muffins and these are perfect! Pinning! Hi Emily – these little muffins look cute and yummy! Thanks so much for joining us and sharing at Best of the Weekend! Pinning and sharing on FB over the weekend – and hope you have a happy one!